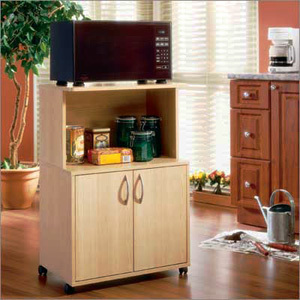 A Very Simple Delissio Microwave Kitchen Cart with Enclosed Storage Space. The Natural Maple Finish Will Definitely Get Your Attention. Features, Plenty Of Storage Room Concealed With Two Doors. Strong Construction. Easy To Assemble. Dimension: H. 36 In. x W. 23.75 In. x D. 15.875 In.